« Happy Birthsdays to you. The Last Post…a job well done. I am gratified that so many of you have seen fit to read my little blog over the past twelve months and to comment upon it, also. Thank you. But I am glad you did take notice, because this means that there are now a lot more people in the world who firstly, know that dummy boards exist and secondly, know what they are and what they were all about. And that to my mind, can only be good. As I said at the beginning of this blog, when I first started to research them all those years ago – very, very few people knew about them and those that were in the know, knew just a smidgeon. I think I told you a little while ago about a young lady, a dummy board fancier, who wanted to do a thesis for her Masters on the subject and she came to me for help. Now she has completed and gained her degree. ( Well Done Julia) and we have access to her work and permission to quote it. So, in this my last post on this blog, I would like to toss a few ideas around and tie up some loose ends, using Julia’s work as a reference point. how they were able to be successful as illusions, what role they played within the space of the home and the larger society of the time, and what they signify in the particular realms of social structure, vision and interior space. Dummy Boards ( unpublished paper- Julia Long – Oxford University). So, we know that illusions and trickery played a large part in the ‘entertainments’ of the wealthier classes in the 17th century when dummy boards were first to be found. This was never more so than in Dutch society where the art of trompe l’oeil was taken to dizzy heights of complexity. 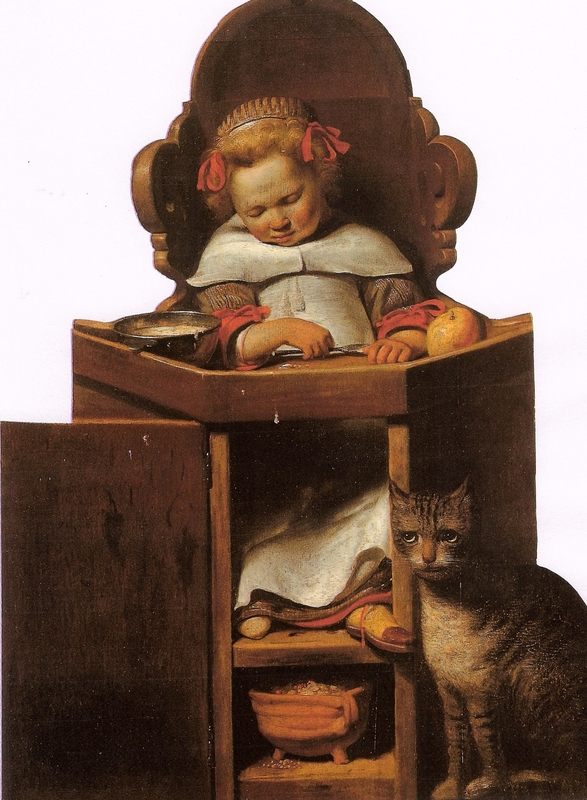 Not only in pictures do we see evidence of this but in perspective boxes, ( those little peephole boxes that became three dimensional when looked into), in dolls houses, which were little microcosms of real life and in other deceits, ( we have talked about some of these in various other posts – the painted food for dining tables, the flat fish placed on chairs to fool the poor hostess, counterfeit coins etc.) It must have been a sad and boring old world to have been a very wealthy person in the 17th century! 🙂 Nothing to do all day but enjoy oneself, no work to do, not even to put on one’s own coat. Is it any surprise that such diversions were invented. The Dutch painter Samuel Hoogstraten had several such items strewn about his house and another devotee of the art of trompe l’oeil commented upon the fact in his own written work. an ‘easy’ deception, but a playful one at that. ( Folk were ) deceived but in a playful way, evoking laughter and conversation. How can something as playful as a dummy board help us to understand the social structure of 17th century life and its meaning and presence in the domestic interior? I have watched people and their reactions to dummy boards, not least to those copies that I have painted and have in my home. A PastMastery commissioned dummy board of Frank as Sir Walter Raleigh now in the U.S.
Now we get a bit technical! ‘either absolutely take away, or pervert the use of reason’ and also he said ‘Astonishment is an excess of admiration, which can never be but evill. Mmmm..well he would- he was a bit of an old killjoy! He wants everyone to rely solely on the mind, not to, if you like, believe their eyes. So, what is an illusion? ‘the attempt to make images that seemingly share or extend the three-dimensional space in which the spectator stands.’ Groves dictionary of art. There are lots of examples in daily life, if we think about it, where we can mistake things, where our eyes deceive us and we won’t go into those here, but dummy boards ( yes our subject de jour…) are pretending to be human or animal and leap from the mere flat page and inhabit the real three dimensional world in which we live. They have no frames unlike paintings and have bevelled edges so do not betray their two dimensional state.They are an attempt at life. However, they can’t really be thought real at all unless there are certain ‘circumstances’ surrounding them, not least the quality of the painting itself coupled with poor light levels, clever placing, juxtaposed items and distance from the viewer to the dummy board. Later, as light in houses improved, window glass became clearer and the manufacture of larger panes was possible. These of course were employed in the newly fashionable sash window. Dummy boards became less believable as a consequence. They were still made of course, but they were now definitely just a bit of fun. Dutch houses tended to grow upwards because of the shortage of building land. They had many staircases and narrow halls, turns in landings and alcoves. Moving through these houses one could catch a glimpse of yet another room through a door, a change in level here a sharp turn there. The Rotterdam Sweeper..busy busy busy. but not moving! 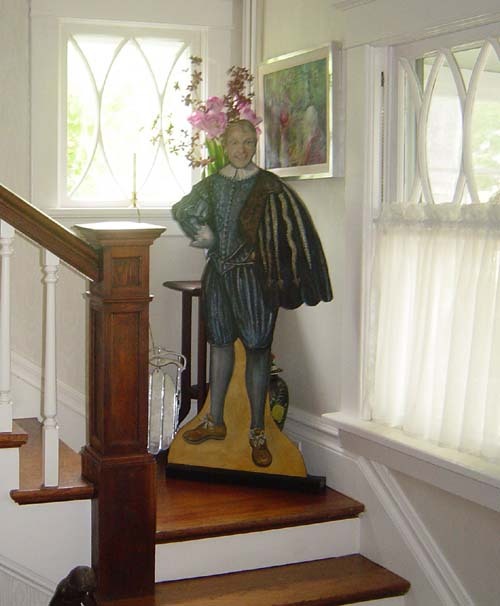 According to many contemporary writers, the home was a source of great pride to Dutchmen in the 17th century. Perhaps this is why we have so many paintings of them. There was a running joke in the Asterix books which I read voraciously when I was a youngster, which more or less stated the fact that Dutch people were cleanliness personified( it’s still a clean place today ) and the females of the family were all but obsessed with it! 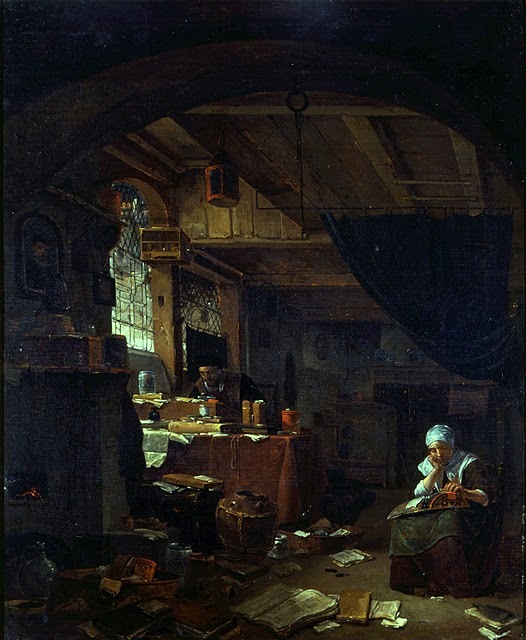 Look at any Dutch interior painting and you will find a woman with a broom or a bucket lurking somewhere! Is it so surprising that we find so many dummy boards of sweepers, cleaners and dogsbodys? And talking of dress being prescribed at this time, dummy boards are a fascinating record of the social structure of 17th century Dutch society. Female members of the household often worked with servants in many of the same tasks, and so there was not often a major difference in dress between the two groups of women. 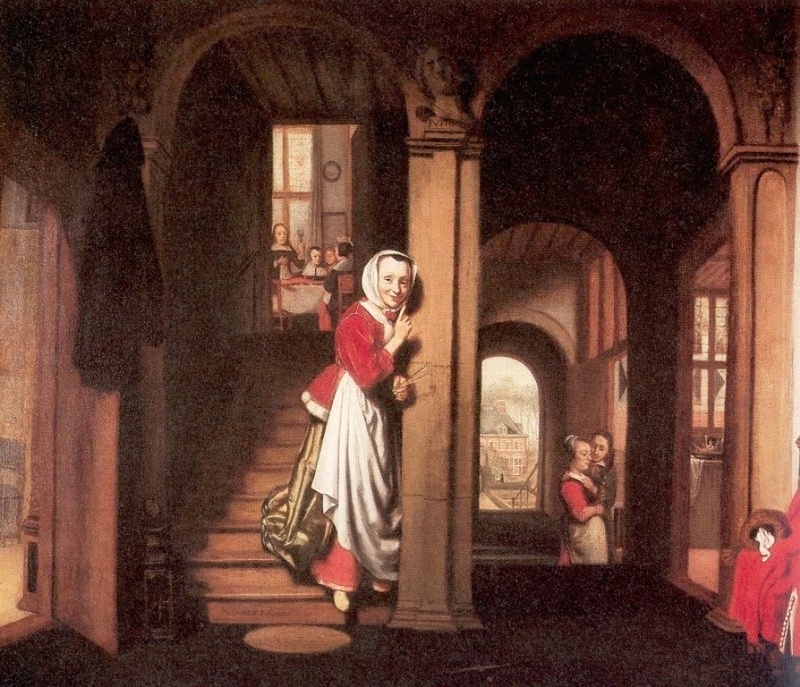 Indeed, Hollander mentions that it is often hard to tell if a woman depicted in a painting is a servant or not! 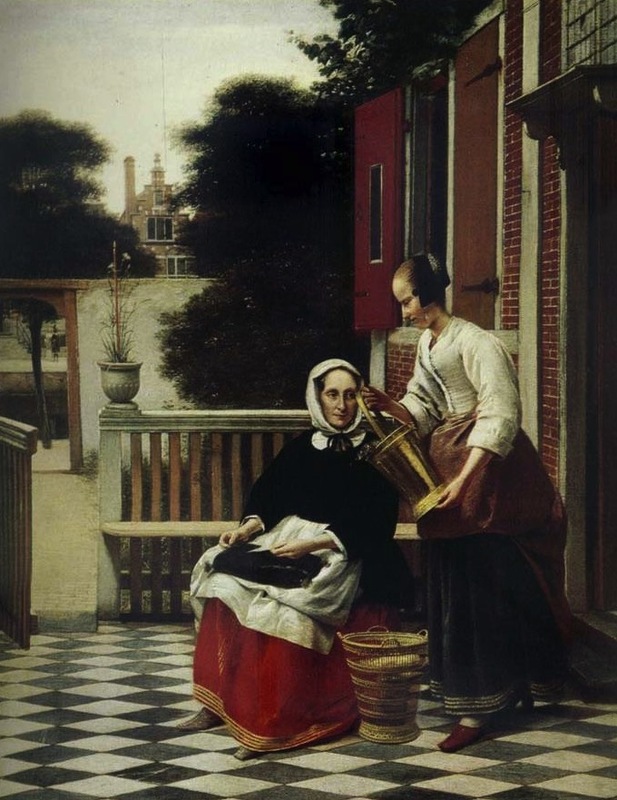 We can see this in the painting below by Pieter de Hooch. Which is the servant and which the Mistress? Well…we are guessing when we say it’s all to do with position in the picture. The Lady is the one with the letter and the servant holds the pail? If the title didn’t tell us, might we assume it was two members of the same family outside for a chat? There was ( this is a laugh depending on your view ) a belief, amongst men that a maid needed watching as she was ruled by the devil…..and so needed to be kept on the straight and narrow! Perhaps this is why we have so many dummy board sweeping maid/mistresses designed to watch over the real maids. ( see Pretty Maids all in a Row )…. A Silent Spy…says Julia…I like that. It’s a fact, that housewives were encouraged by the many didactic volumes of the time, written for women, not only to keep an eye on their servants but to work alongside them as examples of perfect womanhood. We all know what the historic view of women was. We were either succubi, preying on the defenceless man, a creature whose womb migrated and sent us mad now and again ( I kid you not -this is where the word hysterical comes from) or we were examples of sainthood, of pure unadulterated domestic virtue. Prescriptive literature, such as the emblem books by mid-seventeenth century Dutch writer Jacob Cats, classed all women together as beings in need of moral guidance and constant improvement, which could be achieved through domestic work and devotion to the family. The gender roles of the 17th century Dutch household were extremely prescribed too. We need only to look at some of the wonderful paintings of the age to see that men were placed outside and women and children inside the home, where plausibly possible. There is a group higher in the house sitting at a dining table, a woman, the eponymous eavesdropper ( who is capturing your gaze completely ) on the downward stair and further down still, two more people are dallying in an open doorway. The social grouping is very blurred. Do we know which contain the servant and which the master? The clarity of the grouping though, lends credence to Hollander’s idea, his ‘cluster of territories.’ Were the positioning of dummy boards perhaps, governed by the same rules? 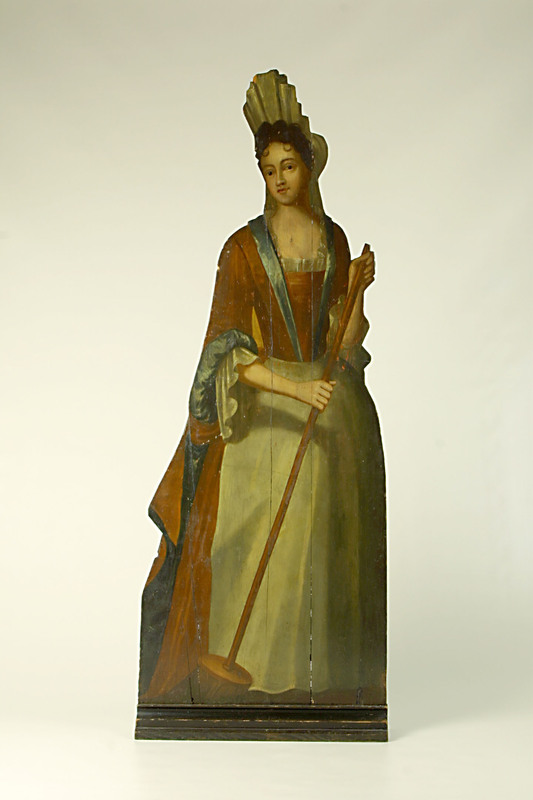 Of the many extant Dutch dummy boards from the 17th century, many depict servants and children. Were they to be placed in the interior space? Many male figures depict men at arms. Were these figures to be placed outside? We know that soldier figures were often found in the garden, both public and private and it is said they were used in ale houses, outside the doors. Perhaps we will never truly know, for written evidence is sketchy. No where do we see a depiction of a dummy board in a contemporary Dutch painting. What a pity. Probably the dummy board that the unfortunate rebel soldier saw in the Wister home. Other figures were to be used in the theatre as extras, along with various servants, hermits and peddlars…in other words – stand ins for real people. The dummy board figure, says Julia, worked on two levels of vision.The first and more obvious, is the perceiving of it by an observer who may or may not be fooled by it but cannot help but be moved by it, being affected by its presence; the second is the imagined continued viewing of the observer by the dummy board. They may have served as the ‘eyes of the house’, effective burglar deterrents, though we have no actual evidence to suggest they were used as such. Dear Old Thomas Peartree ( the Gainsborough figure you remember? ) was a source of discomfort and then amusement to the onlookers in his Suffolk town, though he also served as a calling card for the painter’s abilities. Indeed not only is he unreal and half a man but he does not even possess eyes! How realistic is that? Well actually…very realistic as it’s not possible to know for sure if he is staring at you. Sebastiano Serlio the 17th century theatre designer advocated that figures used in the theatre be made to appear to be asleep. The painted eye cannot hope, he thinks, to convey the real eye and it is this organ that will give the game away. If they are hidden, one will be more likely to be taken in. And so dummy boards inhabit that strange space between the real breathing and moving, living world and the static depictive one and their placing in a human domestic space represents an invasion of that space, of the home, by illusionsm. The 17th century was a time when belief, blind and simple was being tested.People were not always comfortable with anything which made them doubt those things they believed to be true. And many were thrilled by the first and uncomfortable with the latter. Dummy boards may seem to be innocuous bits of painted wood and it might be thought that they played an insignificant role within the social structure of 17th and indeed 18th century life. However they reveal, quite nicely, the inner workings of those societies and built into them are many, many layers of meaning. And of course they are cracking good fun! A lovely dummy board...shhh. He looks so sweet but who knows what he's dreaming about! I hope you have all enjoyed my year’s worth of posts, some serious and full of information, some I hope thought provoking, some I must admit, rather an advert for my painting and some just downright silly. I have thoroughly enjoyed penning them all. I have laughed at the antics of Sir Bumptious Grandly and the Reverent Pillock. I have enjoyed chronicling the doings of my mini dummy boards and have had a whale of a time condensing my thoughts on the figures I have found into short ( and not so short) essays. Do keep looking for dummy boards and when you find them e mail me at sue@pastmastery. I may know them…I may not. And if I don’t I will be very happy to do some research on them. This is a lifelong project. Blowing my own trumpet…no one has seen as many dummy boards as I have, no one therefore knows quite as much as I do about them. I have spent many many years studying them and I still don’t know everything there is to know. Many of my ideas may, in years to come, be found wanting. No doubt, other scholars will come after me. I hope that I have laid a serviceable enough floor for others to build on. Good luck to them. Julia’s was a job well done. I hope mine was too. All my posts will remain public, as an informational tool for those who are interested. Thank you for walking with me whilst I explored that fascinating and forgotten ( but maybe not so forgotten now,) art form, of the dummy board figure. This entry was posted on 04/02/2011 at 10:00 pm and is filed under Uncategorized. You can follow any responses to this entry through the RSS 2.0 feed. You can leave a response, or trackback from your own site. Your blog has always been an absolute joy……informative, erudite and amusing in equal measure. Your book will surely be the definitive reference work for years to come. Thank you so much for sharing your knowledge and enthusiasm for a fascinating subject. I have thoroughly enjoyed reading your blogs and will miss them. Always so full of wonderful information (I loved the costumy bits most!). I hope you will continue to post on the AIM group and I would also like to keep in touch with you privately too. Well..I am still going to be painting in miniature so I hope so. And I would miss all the lovely friends I have on there too Louise…so yes….I shall try to stay on AIM. Dear Sir, I read with interest your blog about dummy boards. I have what I think is a dummy board, but can’t be sure. My father thinks it is of Edward VII – he is depicted in top hat, double breasted jacket and some sort of breeches and boots. Where could I have this curious piece identified? I can supply a photo of it. It stands 71 inches tall. Can you please help me to have it identified properly? Thanks Ron…I have replied to you personally. I am more than willing to help. Hello Carol…. yes I have finished this blog. I ran it for only a year as I had to give up painting…. ill health… but it remains as a tool for those who are interested in dummy boards and an adjunct to my book. Yes…we have only just met but never fear…I have another blog…. called BoxCleva ( and on Facebook ) which is much more craft ( mostly paper but not cards) orientated and will be up your street I think.